[11 mins. 45 secs.] Last year actor Karen Pittman ("Luke Cage", Broadway's "Disgraced") starred as Nya Joseph in the Lincoln Center Theater off-Broadway play "Pipeline". 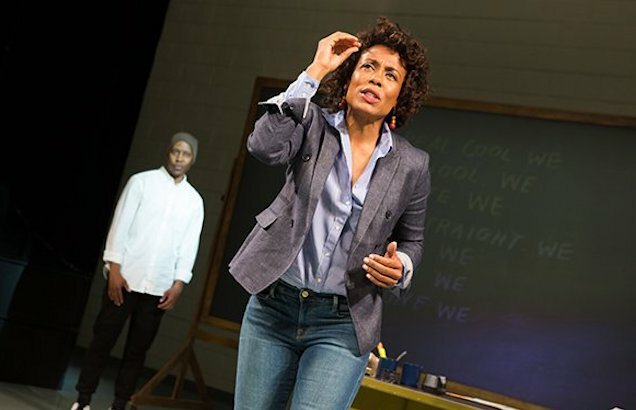 In the play, written by Dominique Morisseau, Nya is a dedicated, inner-city public high school teacher who is committed to her students’ achievement, while she sends her only son, Omari (Namir Smallwood), to a private boarding school. When Omari is involved in a controversial incident which threatens him with expulsion from his school, Nya is forced to reconcile Omari’s rage, her own parental decisions, and the public and private school systems, as she rallies to save her son. A filmed version of "Pipeline" was screened in various cities around the U.S. earlier this month and is now available through the subscription streaming service BroadwayHD.